The days of the boring old refrigerator are gone. Today, manufacturers are constantly thinking outside the icebox to bring new technologies, designs and features into your home. Whether you're remodeling your kitchen, or your old refrigerator just needs to be replaced, choosing a new one may seem overwhelming. This guide will help you focus on a few key things that can help you find the right refrigerator or freezer. Be sure to take several measurements from different locations in case your cabinets or floors are uneven. First, measure the space from the floor to the bottom of the cabinet. Then measure width from side to side. And take a measurement closer to the front of the cabinet and one closer to the back wall. Take a measurement at the top of the space, as well as the bottom. Finally, measure the depth of the opening, from the back wall to the front edge of your counters. Look for taller baseboards or chair rails that stick out farther than the wall. How far will the door need to open into your kitchen? Many refrigerators require their doors to be completely open in order to pull out drawers or access all the shelves. Make sure the doors won't hit cupboards, counters, other appliances or breakfast islands. Take particular care if you have a narrow kitchen. Is there is enough space on the hinge side of the refrigerator for the door to open without hitting your walls? A good rule of thumb is that you'll need at least two inches of extra space for the hinge to work properly and to protect your wall from the door handle. Be sure you have about one inch of extra space above and behind the refrigerator. If a refrigerator isn't properly ventilated, it might use extra energy and it can damage the motor or compressor. Think about how your new refrigerator will be brought into the kitchen. Measure each doorway along the way, including your front door. You might need to remove the refrigerator door handle, or even the door itself to fit. Each adult will need a minimum of 4–6 cu. ft. of refrigerator space, with some extra space for holidays and other gatherings. A couple who doesn't cook at home very often will need about 12–16 cu. ft.
Two people who do more cooking at home should look for a minimum of 18 cu. ft.
A typical family of four will need at least 20 cu. ft., and likely more. One thing to keep in mind when choosing a refrigerator is how often you shop for groceries. Do you like to save money by bulk shopping? Do you have kids who rely on frozen foods to save time? If so, more freezer space should be on your list of requirements. Or do you shop for more fresh foods and go to the store frequently? Make sure you have plenty of capacity for fresh food. If you purchase larger frozen items like frozen pizzas or large entrées, pay special attention to the dimension of the freezer compartment, especially in a side-by-side model. Once you understand the size of the refrigerator you'll need, look at the design that will suit you best. Some of the little things can make a big difference when choosing a refrigerator that will last for years to come. Quick access: Samsung Showcase and LG Door-in-Door technologies provide quick access to frequently used door bins, which puts your favorite foods at your fingertips, making it easier to organize and save energy. Ultimate organization: External, full-width drawers and adjustable bins and shelves let you make space for large platters and tall pitchers while keeping everything in order. Connected: Smart refrigerators with a Wi-Fi- display let you access apps, leave notes, view calendars, find recipes and more. Convertible Refrigerator/Freezers: Adjustable cooling zones let you change from refrigerator to freezer and back, depending on your needs. Custom Flex: Frigidaire Custom Flex door bins move, slide and adjust to make snacking easier or create extra space for drinks. Food freshness: Dual evaporation technology controls humidity in both your refrigerator and freezer to keep food fresher, longer. Fingerprint-resistant: A protective coating on the exterior surface resists smudges and smears. If you have kids, a fingerprint-resistant option might be just what you're looking for to reduce cleaning time. Energy efficiency: With an ENERGY STAR certified refrigerator, you can maximize your energy and dollar savings without sacrificing the features you want. Before purchasing your new refrigerator, also consider ice, water and filtration features. There are three types of ice features to choose from. In-freezer: This type of ice maker is entirely contained within the freezer compartment and is the most cost-effective option. They usually have more capacity than in-door units; however, you'll have to open the freezer every time you want ice, and they take up usable space in your freezer compartment (this is also true for the dual ice maker, below). In-door: With this option, the unit is built into the door of the refrigerator (most common in side-by-side and French door designs). All you have to do is press a lever or touch a button and the ice falls into your glass — no opening doors. Dual ice maker: Maybe you use a lot of ice but you're also looking for the convenience of an in-door unit. A dual ice maker offers both; an in-freezer unit that offers great capacity and an in-door option for added convenience. There are four types of water features to choose from. In-door: The most common type of water feature offers quick and easy access to fresh water without opening the door. In-refrigerator: The benefit of this feature is that it's cost-effective, but, just like the in-freezer ice option, you'll have to open the door to get your water. Plus, it takes up valuable refrigerator space in the compartment. Sparkling water: This feature lets you dispense carbonated water right from your refrigerator, which can be flavored to make homemade soda. The carbonation cartridge can be replaced when empty. Hot water: This feature lets you dispense hot water for a quick cup of tea or other hot beverage. Water filtration: If you choose a refrigerator with a water or ice dispenser, proper water filtration is important. To maintain clean, fresh water and ice, find the water filter that's compatible with your refrigerator and be sure to change it out every six months. Air filtration: An air filter helps eliminate odors from the refrigerator to keep it smelling clean and fresh. Find the air filter that's compatible with your refrigerator and be sure to change it out every six months. 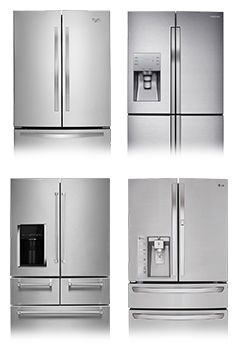 Find a wide variety of refrigerators and freezers at BestBuy.com. Your local Best Buy store also has a selection of kitchen appliances, and Pacific Kitchen & Home premium products are now inside select Best Buy stores, so you can shop from an impressive selection of quality brands. Plus, our friendly Blue Shirts and dedicated Pacific Sales staff are there to answer questions and help with choosing the best refrigerator and freezer for your needs.